What have I really been doing? Well as we discussed I’m working on a pattern. I have finished it but now the hard part and that’s the part where I put myself out there and see if someone wants to buy it. Yup, just that silly part. It’s also that time of year when the local girls all want to be in our traditional festival that celebrates our town discovering a 50 pound gold nugget back in the 1850’s. What do we call this celebration? Why Gold Nugget Days of course. This year I was contacted by five girls and was almost arm twisted into another dress by another quilter friend. Yes I said 5 girls! One girl and her mother were so excited by the idea that they were willing to buy fabric before hand and return it if she didn’t get into the contest. What I learned this year is that only 15 girls can participate and that if more than 15 sign up that they than have to do a lottery to pick the 15 from the group. So this Mother went online on Black friday to buy 10 yards of fabric and we waited and crossed our fingers that her daughter’s number was picked and that she’d be in the contest. Now that’s some town spirit! But back to that 5. I would have to be crazy to make that many dresses. Yes! Yup, that makes me crazy too! Specially when it’s working with teenage girls. My Daughter laughed when I said they are difficult to pin down like the equivalent of stapling Jello to a wall. I have to agree with W.C. Fields when he said, “never work with animals or children”. Anyhow I’m sure you are all curious about the the fabrics so let’s look at them. This is dress number 1. She chose a lovely alabaster taffeta embroidered with dots. This will be accented by an olive green taffeta and a 7 inch needle lace. Dress number 2. This is the fabric that was bought before hand just to insure a great price. This dress will be my first bustle dress. I like a challenge and I’m looking forward to working on this one. Dress number 3. Girl number 2’s best friend. They also bought their fabric online because she wanted this specific fabric. It took awhile to find it but we did finally. This dress is still in the thought process which is fine as I can only work on one dress at a time without confusing myself. I have my work cut out for me in the next few months! But as I said, I like to be challenged and I love to see these dresses take shape. It makes me look like a genius to create something that these girls see in their mind. There will be more to report so stay tuned! Last week I got the whole tourist treatment at my Daughter’s house. I never lifted a finger (though I did ask), my laundry was even done but not by me, I was wined and dined (in my case water) and chauffeured around to wherever I so desired. I think you call that a vacation? I saw and shopped in several fabric stores. Went to a huge Outlet Mall which is within walking distance of my Daughter’s house, but not recommended because of traffic and mostly because who wants to carry a million bags up the top of a hill!? DD and her sweet boyfriend (the SWEETEST!) entertained me and gave me a great visit. I think I’ll go back! There was an agenda made and adhered to. Without it I would have been lost. DD scouted out fabric stores for me before I got there. That is one sweet girl! 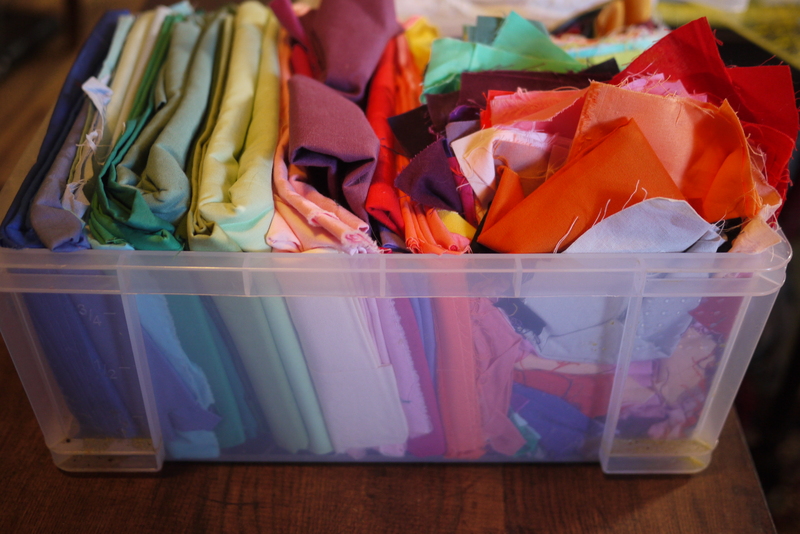 In fact she even let me buy her some fabric because… she wants to sew! I did foresee this and give her a basic sewing machine for Christmas (so she could mend once in a blue moon). Boy was I surprised that she wants to make things like letter shaped pillows and kid things. So I started her off with a few instructions and a few quarters to make pillow cases. If she really likes it I’ll get her a better machine. During this visit I also met some of Sweet Boyfriend’s family. I can I say I was terrified! We all want to make a good impression and we don’t want to scare people away right? Well that was my fear but I shouldn’t have been worried because the apple doesn’t fall far from the tree and I met two of the sweetest ladies! I’m so happy that they are in my Daughter’s life and I hope to get to know they better. They made me feel so special and happy to meet them. I hope I can learn that trick of welcoming people and easing their silly worries. Then the day arrived to visit the “#2 place to travel to Europe without leaving the USA” (according to Huffington Post). DD wanted me to take a picture under a store front sign with my birth name on it. I was born a Rasmussen and according to Wikipedia it’s a Danish name. Looks like I need to brush up on my heritage. It also explains my lack of color within my own family. A fun filled visit to the coast also meant a visit to see Solvang. Such a cute town! I helped keep it busy lots of retail therapy. Unfortunately I couldn’t indulge on these yummies but I was told they were delicious. Aebleskiver, a MUST if you visit. I did have one bite and it was worth it! Even a Hotel gets a Danish face lift in this town. Wish I knew what these said! Made with a few fabric purchases. I was inspired by a quilt I saw in Betty’s Fabric store. Unfortunately they are not online, what a waste! And that’s my long winded post. I hoped you enjoyed it! I’ll be back soon with what’s really keeping me busy. If you are ever anywhere near SLO, I highly recommend you visit this beautiful landmark, you will not be disappointed. You may be shocked but not disappointed. Every room in this Hotel is decorated in their own way, most very colorfully. Even The restrooms in the Restaurants did not miss out. Really they need to be seen to be believed. Don’t worry, your computer is just fine, this is really a pink dining room. Go and enjoy, I did! My word of the year is always in the back of my mind. No longer will I ignore it. So Today I’m giving you a glimpse of my finished pattern. Next step is to find a proof reader and perhaps a pattern tester. Anyone out there interested? But first let us admire some of Mother Nature’s gorgeous winter color. That branch fell from above, scared the dog and shook the earth. Right now I’m debating on whether to keep it intact or let Hubby cut it up and burn it. Those greens are just so lovely! So back to the tease. What do you think? Are you like me and save old linen hankies but don’t know what to do with them? I think I just discovered a whimsical way to prolong their beauty. This is a great place to use them specially if they are partial damaged or stained. What about those bits and pieces of old lace and tatting? This wasn’t on my list day of things to do today but I grabbed a few minutes. Now I need to finish packing because I’m going to the coast! DD invited me down to see her new house and to go shopping of course! Last night I was in a bit of a panic because I couldn’t fit my clothes in my suitcase. If my clothes don’t fit, how was I to bring anything home? I thought about just packing my undies and washing the same clothes every night, but I’m a girl who likes clothes and I need to accessorize. Than Hubby (who’s smarter than I) suggested a large suitcase instead of a carry on. Yay! Know I can pack 4 pairs of shoes and buy fabric, Lush bombs, Danish do-dads and anything else I think I might need. Let me know if I’ve quipped your interest. I’d love to hear what you think. I’ll be back soon with warm beach pictures! With the start of a new year, most of us, myself included, want to make improvements on ourselves. We try to eat better, exercise more and we encourage ourselves to be better people. So that’s my plan, I’m just going to let it play out. I’m not going to push myself and make this a chore but I’m no longer going to hide those ideas in a folder telling myself that it’s a silly idea because what’s the worst thing that could happen? I find that no out there likes what I like? If that’s the case I would still be true to myself because I did something I enjoyed doing and that is all that matters. Though it would be great to fund my fabric addition! So that’s my New Year’s resolution, 2016 will be the year of Bravery! How many of you received coloring books for Christmas? 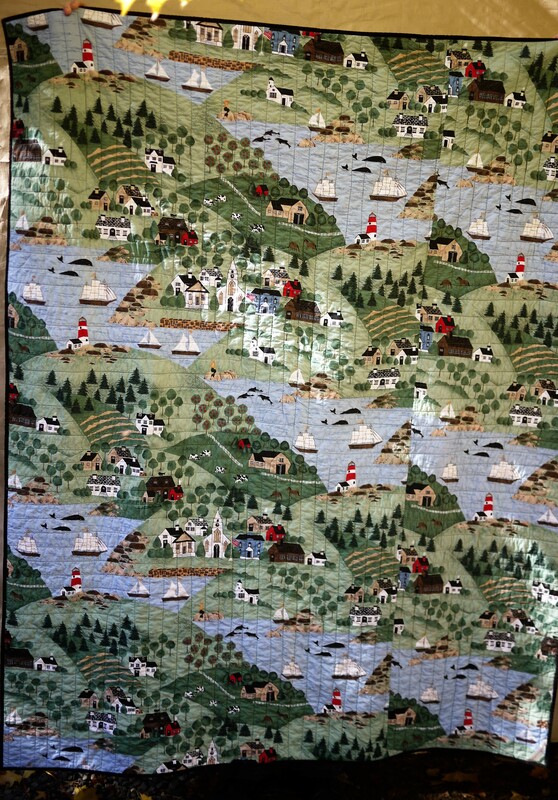 How many of you saw the great ideas for quilting? Funny part? I mocked these books when I first saw them months ago. I was heard to say, “I’m too old to color”. Well never say never because I was inspired and this is what came about. The soft glow in a cold winter day. Wish those candles produced heat! Aren’t we all glad to be done with one Holiday, or is that just me? I honestly don’t want to see another turkey for a year! And I’m not ready for Christmas music yet! But I do love spending time with family and friends, there is a bright spot in the frenzy of the Holidays and it’s not the food! At our house Thanksgiving produces so many leftovers but these leftovers weren’t leftovers from a turkey, these were actually leftovers from a quilt that I know I’d never finish. All I ever finished were these blocks. Lucky me that they ended up matching so well to become a small wall hanging. This will be a perfect gift for a non-quilty friend who doesn’t how these are leftovers and won’t see my mistakes. Win-win! While my DD was here enjoying the turkey Holiday, she mentions that she needed a new pillowcase, a Christmas one to be exact. Before I started her Christmas pillowcase I had to finish up a class project which I then turned into a pillowcase. This class was sew fun! Admittedly it was confusing but I stayed the course because I’ve always wanted to make a cathedral window quilt. Now I just hope I can duplicate it for my own project! A Christmas pillow was made, another place to use up leftover scraps and some leftover rhinestones. This was a fun one too. I’ve forgotten how much fun a log cabin can be to make. I’m thinking there will be more of these in the future. While I was pulling out all these leftovers, I found another start that stalled. I wasn’t happy with my previous color but hadn’t sewn in the replacement color. I’m still not thrilled with all this pink but maybe I’ll learn to love it. If I had enough fabric I would switch out the darker pink for the light pink in the 9 patches but I just don’t have enough to make that work. This is always the problem when you use stash fabrics, you just have to make it work and learn to love the results. This isn’t the most user friendly pattern but I’m learning to make friends with the “Y” seam. Maybe by the time I finish my last seam I’ll be an expert, or smart enough to know better to avoid them next time! Any suggestions on making “Y” seams? 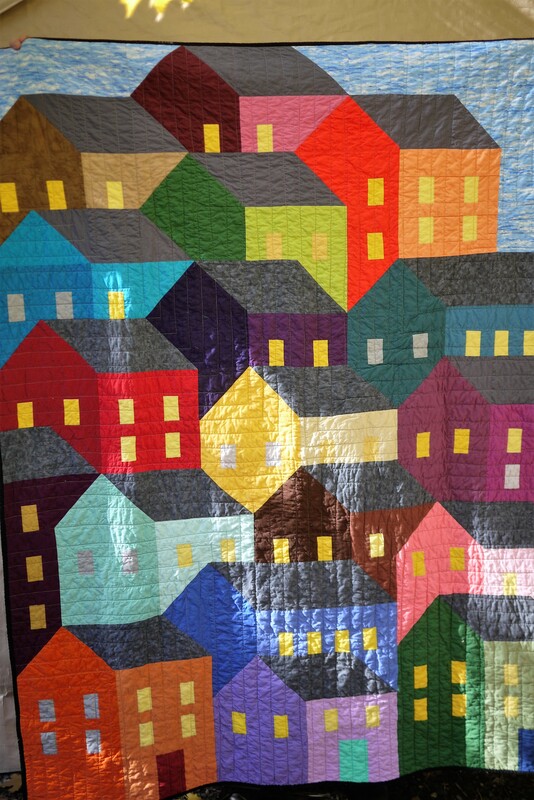 My Seaside village quilt was finished in time to snuggle under and keep warm. There is nothing like a quick finish to make you feel good. Not to mention keeping you warm on a cool California fall evening. Even more special is the backing I used. This was given to me (6 yards) by my SIL several years ago. It has been just sitting on my shelf taking up space. I gave it a home and now it has a special memory for me as well. Speaking of my SIL, my in-laws brought her to our local quilt show. She still lives in a nursing home but there are many improvements in her health. She may not be able to walk yet but every day is better than the last. I had to laugh at my MIL pushing my SIL in her wheel chair and my SIL reading the tags to my MIL. These two are a perfect pair! One can’t see very well and one can’t walk BUT last year she wasn’t even talking! Talk about a huge step! It was a touching a sweet moment to see these two woman work together, that’s why I love them so! This box of solids is still full, maybe the lid closes easier but other than that I can’t see a change. Today I’ve cut up 5″ squares to go with the two Kaffe charm packs I bought at the quilt show. As I flutter from one chore to the next, I stop and sew together a few blocks. My Physical Therapist doesn’t like me sitting too much. I set my timer to 15 minutes, sew till it rings and flutter off to my next chore. Yesterday it was grouting the bathroom floor. Today I’m putting the room back to rights, without the heavy lifting! That what son’s are for, right? Hopefully I’ll be back soon with another finish!